One of the most versatile ways of feeding greater numbers of guests with a realistic budget, whether part of a wedding day meal or simply celebration parties. It does not just have to be piggy either, we can offer lamb or beef in a similar style either as an option or alongside the hog roast. Starting with the most basic pork rolls this can be fortified with a selection of salads, a dessert buffet or choosing starters to turn it into a three course meal. For smaller parties then this provision can still be an option but using joints of meat rather than the whole pig. 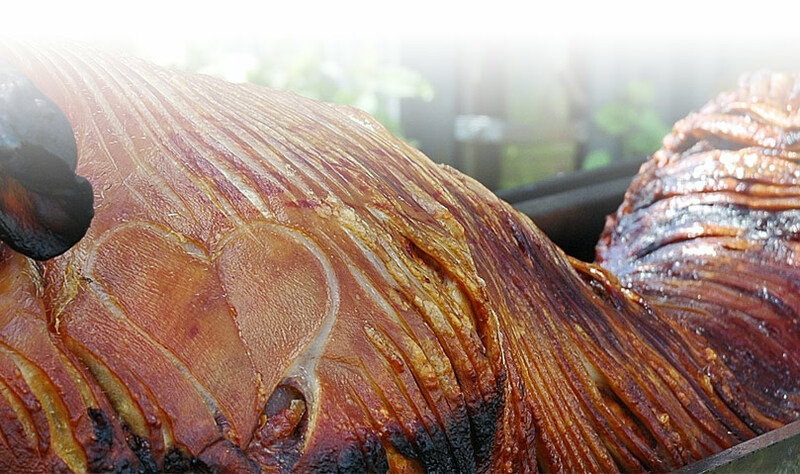 We use the latest CE approved rotisserie style of roaster which provides the best most evenly cooked succulent meats. This would be carved and presented to your guest by chef with the options you choose. As a totally mobile unit we also have a canopy to cover all the food and serving areas ensuring the highest standards of food hygiene which are still flexible enough to be served at outdoor events and parties totally independently. If you are hosting a barbeque and want to enjoy the all important time with your guests, then we can help. Maybe the provision of a full menu, cooking, serving, bar service with draught beer options are available; or just the supply of staff to arrive at your venue and assist with cooking your food service and clearing up.